Ideal for those interested in law, wanting to improve their legal writing, drafting, communication and negotiation skills. The course will provide an opportunity to practise networking skills and co-operation with other professionals. During your course you will visit a court and have a chance to review the UK legal process and enjoy an evening networking event with professional colleagues and staff. Legal Entry Course is designed for those studying for a career in law. Legal Exec Course is designed for those working in legal practice. Legal Combo Course is designed for those who have limited time and want to focus on specific subject matter in focused 1-to-1 sessions. Fixed Date Legal English and TOLES Course is designed for those who want to combine their study with a qualification. All our Legal English courses also incorporate Business Communication Module 1 for the development of general business communication skills required in an international environment. Business Communication Module 1 focuses on essential business functions including: formal and informal writing; telephoning; reading business documents and numerical information; language of meetings; dealing with native English speakers; travel; business culture; diplomacy and entertaining. Are you looking for something more intensive? 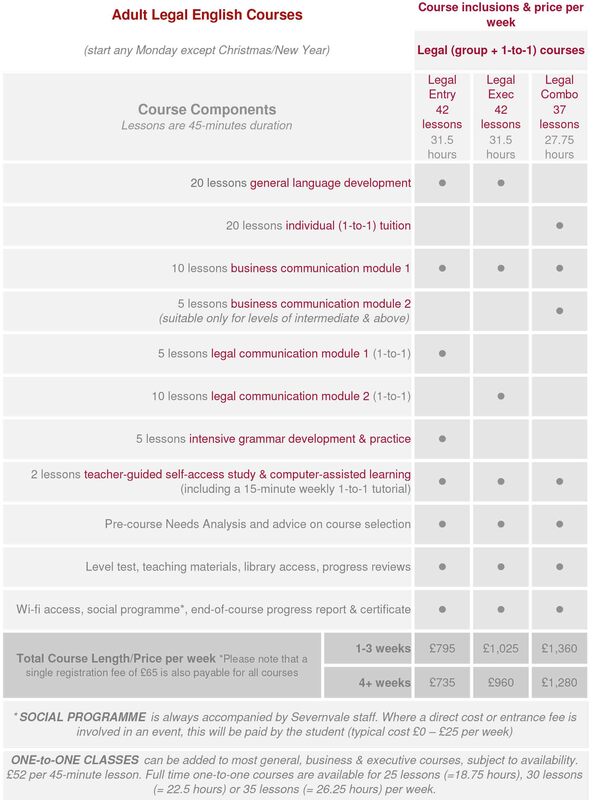 Our most intensive and personalised Legal English programme is the Legal Combo course which incorporates 20 x 1-to-1 classes (Legal and General English) alongside Business Communication modules 1 and 2 (37 lessons/27.75 hours per week). Please contact us and we will carry out a bespoke needs analysis to ensure the course is aligned to your individual requirements.